MAKING A PURCHASE WITH THE ORIGINAL MATTRESS FACTORY WILL NOT INCREASE YOUR CHANCES OF WINNING. PROMOTION PERIOD. Promotion begins at 12:00 AM EDT on April 1, 2019 and ends at 11:59 PM EST on June 30, 2019, when all entries must be received (“Promotion Period”). ELIGIBILITY. This sweepstakes (the “Promotion”) is only open to individuals who: (a) are legal residents of the fifty (50) United States and the District of Columbia and (b) are at least eighteen (18) years old as of the date of entry. 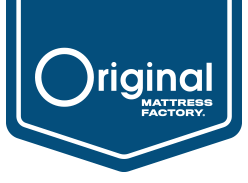 Employees of The Original Mattress Factory, Inc.; any of its affiliated companies; or any other party associated with the development or administration of this Promotion; as well as the immediate family (i.e., parents, children, siblings, spouses) and persons residing in the same household, as such individuals are not eligible. This Promotion is subject to all federal, state, and local laws and regulations and is void outside of the U.S. and where prohibited by law. SPONSOR. The Original Mattress Factory, Inc., 4930 State Road, Cleveland, OH 44134 (“Sponsor”). AGREEMENT TO OFFICIAL RULES. Participation in the Promotion constitutes your full and unconditional agreement to and acceptance of these Official Rules and the decisions of Sponsor, which are final and binding. Winning is contingent upon fulfilling all requirements in a timely manner. WINNER SELECTION AND NOTIFICATION. Winner selection will be conducted by random drawing from all eligible entries on or about July 5th, 2019 (the “Drawing Date”). Individuals do not need to be present to win. Any potential winner will be notified by mail, email and/or telephone. If a potential winner cannot be contacted, does not respond within ten (10) days from the date the Sponsor first tries to notify him/her, and/or the prize or prize notification is returned as undeliverable, such potential winner forfeits all rights to win the Promotion or receive the prize, and an alternate potential winner may be selected. Upon contacting a potential winner and determining that he/she has met all eligibility requirements of the Promotion, including without limitation the execution of required waivers, publicity and liability releases and disclaimers, such individual will be declared the “winner” of the Promotion. PRIZE DESCRIPTION. There will be one (1) Grand Prize winner. The winner will receive one (1) gift certificate to The Original Mattress Factory. The retail value of the prize is $500. Please note that delivery is not included and any applicable shipping charges must be paid in full by the winner. 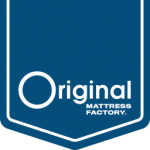 The gift certificate may be used toward the purchase of any product sold by The Original Mattress Factory, including shipping and delivery services. If the winner purchased a new Original Mattress Factory mattress set within the Entry Period and presents a valid proof of purchase receipt, Sponsor will reward the winner with up to $500 instead of the gift certificate. NO PRIZE TRANSFER OR SUBSITUTION. Except at the sole discretion of the Sponsor, no substitution, cash redemption or transfer or prize(s) allowed. Sponsor reserves the right to substitute for the advertised prize a prize of equal or greater value if the advertised prize becomes unavailable for any reason. If a prize is forfeited for any reason under these Official Rules, it may, in the Sponsor’s sole discretion, be awarded to another eligible participant. GENERAL CONDITIONS. Sponsor reserves the right to cancel, suspend, and/or modify the Promotion if any fraud, virus or other technical problem corrupts the administration, security, or proper play of the Promotion, as determined by Sponsor in its sole discretion. In such event, Sponsor reserves the right to select a winner from among the eligible entries received up to the time of the impairment or Sponsor’s identification of the impairment. Sponsor reserves the right in its sole discretion to disqualify any individual it finds to be tampering with the entry process or the operation of the Promotion or to be acting in violation of these Official Rules or in an unsportsmanlike or disruptive manner. Use of bots or other automated process to enter is prohibited and may result in disqualification at the sole discretion of Sponsor. Any attempt by any person to undermine the legitimate operation of the Promotion may be a violation of criminal and civil law and, should such an attempt be made, Sponsor reserves the right to seek damages from any such person to the fullest extent permitted by law. Sponsor’s failure to enforce any terms of these Official Rules shall not constitute a waiver of that provision. In the event of a dispute as to any entry, the authorized account holder of the e-mail address used to enter will be deemed to be the entrant. The “authorized account holder” is the natural person assigned an email address by an Internet access provider, online service provider or other organization responsible for assigning email addresses for the domain associated with the provider, online service provider or other organization responsible for assigning email addresses for the domain associated with the submitted address. All activity arising out of and relating to the Promotion is subject to verification and/or auditing for compliance with the Official Rules and you agree to cooperate with Sponsor concerning verification and/or auditing. All references to an entrant’s status as a “winner” are subject to Sponsor verification and/or auditing. If verification activity or an audit evidences non-compliance of an entry or entrant with the Official Rules as determined by Sponsor in its sole discretion, Sponsor reserves the right to disqualify the entrant and remove the entry from the promotion at any time. PUBLICITY. Except where prohibited, by participating in the Promotion and regardless of whether you are a winner, you grant Sponsor an exclusive, irrevocable license to use, alter, adapt, publish, distribute, copy, exhibit, display, market, promote, advertise, publicize and otherwise exploit your entry, including your name, signature, likeness, written and other entry materials in whole or in part, in any manner and for whatever purpose Sponsor shall elect, in any and all languages, and in any and all media now known or hereinafter developed, including but not limited to, website, television, radio and/or printed materials, worldwide in perpetuity, without further compensation, notification or permission. You shall not claim or be entitled to receive any compensation or credit for such use. DISCLAIMERS. Sponsor is not responsible for entries that are lost, late, misdirected, incorrect, garbled, or incompletely received, for any reason, including by reason of hardware, software, browser, or network failure, malfunction, congestion, or incompatibility at Sponsor’s servers or elsewhere. Sponsor Entities are not responsible for errors in the administration or fulfillment of this Promotion, including without limitation mechanical, human, printing, distribution or production errors, and may cancel, terminate or modify this Promotion based upon such error at its sole discretion without liability. In no event will Sponsor be responsible for awarding more than the number of prizes specified in these rules. SPONSOR ENTITIES MAKE NO WARRANTIES, REPRESENTATIONS OR GUARANTEES, EXPRESS OR IMPLIED, IN FACT OR IN LAW, IN REGARDS TO THIS PROMOTION OR THE MERCHANTABILITY, QUALITY OR FITNESS FOR A PARTICULAR PURPOSE REGARDING ANY PRIZE OR ANY COMPONENT OF ANY PRIZE EXCEPT AS MAY BE SET FORTH IN THE PRIZE MANUFACTURER’S WRITTEN LIMITED WARRANTY WITH RESPECT TO THE PRIZE. APPLICABLE LAWS AND JURISDICTION. This Promotion is subject to all applicable federal, state, and local laws and regulations. Issues concerning the construction, validity, interpretation and enforceability of these Official Rules shall be governed by the laws of the State of Ohio, without regard to any principles of conflict of laws. All disputes arising out of or connected with this Promotion will be resolved individually, and without resort to class action, exclusively by a state or federal court located in Cleveland, Ohio. Should there be a conflict between the laws of the State of Ohio and any other laws, the conflict will be resolved in favor of the laws of the State of Ohio. To the extent permitted by applicable law, all judgments or awards shall be limited to actual out-of-pocket damages (excluding attorneys’ fees) associated with participation in this Promotion and shall not include any indirect, punitive, incidental and/or consequential damages. WINNER’S LIST. After the contest drawing date, a list of all winners may be obtained by submitting a written request to 4930 State Road, Cleveland, OH 44134 or by sending an email request to [email protected] within six months.